For the first time in four years, both houses of Congress passed a budget. The grand compromise that had eluded the body every few months (and left a wake of exasperated tempers and a 17-day government shutdown) was finally reached. Phew, right? We're done with this. No more cliffs or fiscal showdowns. Treasury Secretary Jack Lew writes John Boehner Thursday reminding him that the nation's debt limit was only extended through February 7, 2014. 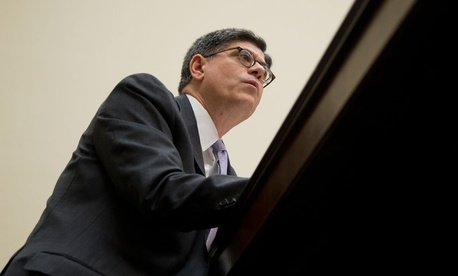 "When that suspension period ends, the United States will reach the debt limit again," Lew writes. "At that time, in the absence of Congressional action, Treasury would be forced to take extraordinary measures to continue to finance the government on a temporary basis." In the case of no action, "we would be able to extend the nation's borrowing authority only until late February or early March 2014," says Lew. And thus, it starts again. Like last time, it may not be so easy to get a deal. "I doubt if the House or, for that matter, the Senate is willing to give the president a clean debt ceiling increase," McConnell told reporters this week. "Every time the president asks us to raise the debt ceiling is a good time to try to achieve something important for the country."